ALAWEEN 3 touches down this friday at its new home, The Colosseum in Vauxhall. ALAN are without doubt one of the most forward thinking and vibrant collectives promoting within the current london scene. Their diverse, energetic, full of ideas and their not afraid to use them!. The Colosseum is a refreshing change for the event and is definitely a underused club on the london circuit. The Club has multiple rooms and loads of hidey holes to chill in with your crew and newly acquired friends. This event will be receiving an across the board recording service fron BDR so expect the live sets up on the site soon afterward. Hosted by Threshold and serving you legends in Jungle, DnB, Ragga and Dubstep! So here we are again... Inviting you to our biggest night of the year! We work hard on this for a long time now and have been building it up since ALAWEEN II! Our ethos is that of inspiring others and spreading love to everyone and we haven’t failed! This event will yet again top your expectations in what to find at an ALAN... With more people involved, more technology, more resources... It can only get better! NO MORE ALAN AT HIDDEN!… It is with our great pleasure that we announce ALAN IS MOVING TO... The Colosseum! HOORAH! Which is still in Vauxhall so its still just as easy to get to for everyone outside of London! And everyone inside of London should have found it easy anyway! So now thats out of the way - Lets tell you about this VERY special party!!! whole club that you have come to know and love. ♥ Dub Clinique HOSTING A ROOM - more news to be announced soon including a VERY special line up!!! ♥ Live Room Recordings by Braindamage Radio - They’ve been doing Braindrop & Elysisn so why not ALAN? ♥ FULLY Playable Retro Arcade by HANDBAKED ARCADE... SERIOUSLY TOO much fun! don’t get lost boys and girls! £6 Ltd Early Birds ON SALE NOW UNTIL SEPTEMBER 1ST, £8 ADVANCED, £12 OTD Before 12pm, £15 After 12. FANCY DRESS!!! You should all know this right now! Prizes will be free tickets & Random gifts for fun. DJ Cheeba is one of the finest DJ and A/V artists working today. Having recently gained notoriety as one of Solid Steel's new skool residents, it's his blend of undeniable turntable skills, timeless knowledge of beats and breaks, eye for the obscure and tireless attention to detail that leaves sets him ahead of the competition. Armed with Serato, two quick hands and the most diverse crate of dance floor fillers you’ve heard, the Boom Monk has developed a sound and style that is undoubtedly his own. The mighty Ninja Tune have been impressed enough to approach Ben to provide a series of ‘Boom Monk Zen’ mixes for their world famous Solid Steel radio show, which is broadcast in 30 countries world wide. ♥♥♥DUB CLINIQUE♥♥♥ - label Launch from a LEGEND!!! Its all very HUSH HUSH! but we have been privileged to have been ask to showcase this launch night for a VERY special up and coming label! PLUS A VERY SPECIAL GUEST TO BE ANNOUNCED CLOSER TO THE EVENT!!! As of today we are back online after our hack attack back in early September. Kicking off the restart of our Blog articles is the the one and only WONDERLAND. These guys haver been going from strength to strength since the end of 2010. Now we are coming to the final monthes of 2011, and their parties have become without question "THE! event you just dont miss". If youve been youll know why, if you havnt then take this article as your cue to get down there on saturday night. -Crazy games, silly activities and interactive installations. 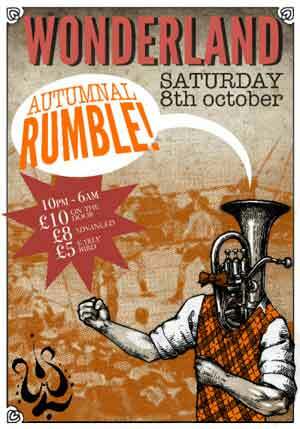 This time round the Queen of Hearts invites you to take part in her Royal Rumble Rave Off. Take to the ring and compete to become the Queens Boogy Champion! Gaining her favor and all the unearthly pleasantrys that come with it...fail the Queen and feel her rath!! Its Rumbling time...are you up to it?? Tea and cake galore, so get in in your face! -ALL audio powered by FUNKTION ONE, courtesy of RSH Audio. -Massages from the lovely Fairiefoo Masseurs. !!! ***Plus much, much more; some to be announced... some a surprise***!!! Due to the recent hack of our server we have lost quite alot of blog article content. As of today we will start the process of posting new articles. One positive out come of the hack is that we have now changed how we host our music. The new system uses a service called Cloud Files, This service duplicates our server in many places around the world making our download speeds stay at the same super fast rate, no matter where you are in the world. So try downloading a new mix and witness our lightning fast service. This has resulted in the site losing alot of content.. The content is not lost as such... it just has to be re-inputed by me.. This will take days and days of work... we will have the site back to normal by early October..